Originally from Kansas City, Richard Simon is a "recovering" English teacher who picked up the bass at age 30 and apprenticed with the elder elite of the Los Angeles jazz scene, including Red Callender, Buddy Collette, Teddy Edwards and Ernie Andrews. 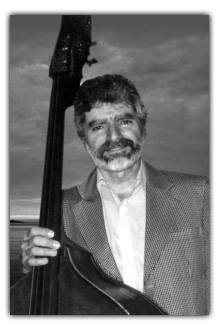 Richard has played traditional jazz with Pete Fountain, swing with Ken Peplowski, and be-bop with Richie Cole. He can be heard on recordings with Keely Smith, Al Viola, Houston Person, Gerald Wiggins and Chico Hamilton. He's toured Japan three times and performed twice with the King of Thailand. Richard is deeply involved in jazz education: he is program director for JazzAmerica, a non-profit organization that provides tuition-free jazz instruction after school and in summer "WorkChops." He is proud to have worked and recorded with Portland's premiere vocalist, Rebecca Kilgore.